Paget’s Disease of Bone; Alkaline Phosphatase; Calcitonin; Zoledronic acid. Paget’s disease of bone is a patchy skeletal disorder characterized by an increase in bone resorption and formation in the affected areas. It affects up to 3% of individuals of Anglo-Saxon origin over the age of 40 years but is rare in Arabs. Although most patients are asymptomatic, a variety of symptoms and complications may develop directly from bone involvement or secondarily to compression by bone expansion and increased blood flow. The disease can be treated by using medications that inhibit bone resorption, such as calcitonin and the bisphosphonates. Here we describe the case of an Omani patient with the disease, involving the skull, spine, pelvis, and tibia. He presented to the endocrine clinic in Sultan Qaboos University Hospital with a six-year history of headache, bone pain, progressive skull enlargement, and left-sided deafness. His alkaline phosphatase (ALP) level was 1500 U/L. His disease responded gradually to six months of subcutaneous and nasal calcitonin followed by a single 5 mg intravenous injection of zoledronic acid. This resulted in a further progressive reduction of his bone pain, skull size, and improvement in his hearing, as well as normalization of his serum ALP levels after one-year. This effect has been sustained for 3 years. 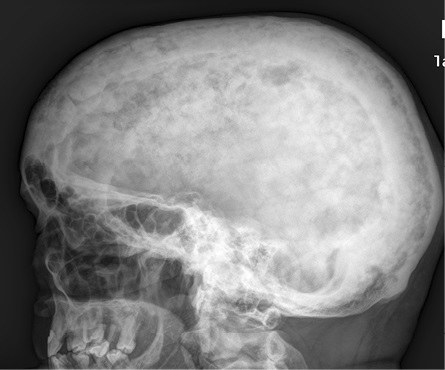 Figure 1: The skull X-ray showed thick bones and the “cotton wool” spots that characterize the osteoblastic response. Table 1: Osteocalcin and urinary deoxypyridinoline levels before and after treatment. Bisphosphonate therapy is now the most commonly used treatment for Paget’s disease, often normalizing biochemical markers of the bone turnover for prolonged periods.9 Here we report the case of a 66-year-old patient who responded dramatically to treatment with calcitonin followed by a single injection of zoledronic acid. Figure 2: A technetium-99m hydroxy diphosphonate bone scan before treatment showed increased uptake in the affected areas; the skull, spine, pelvis, and the right tibia. Uptake in the skull was high (97%) compared to the left femur (3%) with a ratio of 34%. Figure 3: Response of ALP to calcitonin and zoledronic acid injections. A 66-year-old Omani male presented to the endocrine clinic in Sultan Qaboos University Hospital with a six-year history of progressive skull enlargement [Figure 1], bone pain, left-sided deafness, tinnitus, and unsteadiness of gait. He had undergone coronary artery bypass surgery successfully seven months prior. He was taking simvastatin, aspirin, and valsartan. A magnetic resonance imaging (MRI) brain scan was obtained three months earlier to exclude the possibility of a space-occupying lesion. His physical examination revealed enlargement of the skull and sensory neural deafness in his left ear. The investigations showed normal bone, electrolytes, and liver profiles (calcium 2.3 mmol/L, phosphate 1.3 mmol/L, creatinine 80 mmol/L, albumin 48 g/L, aspartate aminotransferase (AST) 25 U/L, and alanine aminotransferase (ALT) 21 U/L). However, he had grossly elevated serum ALP (1500 IU/L; normal range 45–100) and bone formation and resorption markers osteocalcin (139 UG/L; normal range 13–25) and urinary deoxypyridinoline/creatinine (63 nmol/L; normal range 2.3–5.4). The skull X-ray showed thick bones and the “cotton wool” spots that characterize the osteoblast response [Figure 1]. The bone scan showed the involvement of skull, ribs, cervical spine, and tibia with an isotopic skull:femoral ratio of 34% [Figure 2]. The clinical, biochemical, and radiological findings were diagnostic of active Paget’s disease. The patient was unaware of any similarly affected family member. Figure 4: Technetium-99m hydroxy diphosphonate uptake in the skull after treatment substantially reduced to 80% and 2% in the left femur with a ratio of 4%. Initially, we started him on subcutaneous calcitonin daily for six months. During this time his bone pain improved, and there was a small fall in ALP levels. This was followed by a single 5 mg intravenous injection of zoledronic acid. 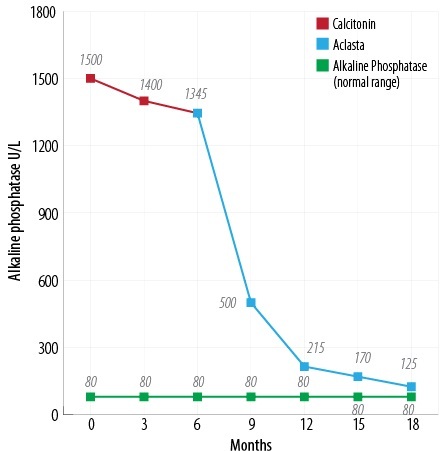 This resulted in a gradual reduction of serum ALP from 1500 U/L to 112 U/L [Figure 3], and normalization of osteocalcin and urinary deoxypyridinoline levels [Table 1] over an 18 month period with a considerable improvement in his clinical symptoms. There was a reduction in head size, indicated by the size of his Kuma (an Omani hat). A repeat bone scan revealed a marked reduction of the skull:femur ratio from 34% to 4% [Figure 4]. Currently, his response to treatment is being monitored with serial ALP measurement. If these increase, a further infusion of zoledronic acid will be given. He was also given calcium and vitamin D3 two weeks before starting treatment to exclude the possibility of associated vitamin D deficiency osteomalacia. Calcitonin treatment is infrequently used in the management of Paget’s disease. However, our experience indicates that it will improve bone remodeling with obvious radiological improvement in juvenile20 and adult Paget’s disease.4 Furthermore, normal lamellar bone is laid down during treatment.18 For this reason, we usually give a short course of calcitonin before starting bisphosphonate treatment particularly when affected areas of the bone are likely to cause problems and need strengthening. Patients with Paget’s disease requiring treatment should receive calcitonin initially to reduce bone turnover and allow normal bone remodeling before starting treatment with a bisphosphonate. 1. Paget J. On a form of chronic inflammation of bones. Med Chir Trans 1877;60:37-63.9. 2. Schmorl G. Uber Osteitus deformans Paget. Virchow’s Archiv fur pathologische Anatomie und Physiologie 1932;283:694. 3. Woodhouse NJY. Paget’s disease. Clinics in Rheumatology Disease 1981 Dec;7:3. 4. Woodhouse NJY, El-baage T. Paget’s disease in a Bedouin. Successful Management with calcitonin and sodium Etidronate. Saudi Med J 1988;9(1):78-82. 5. Alshaikh OM, Almanea H, Alzahrani AS. Paget disease of the bone: does it exist in Saudi Arabia? Ann Saudi Med 2011 May-Jun;31(3):305-310. 6. Howarth S. Cardiac output in osteitis deformans. Clin Sci 1953;12(3):271-275. 7. Barry HC. Fractures of the femur in Paget’s disease of bone in Australia. J Bone Joint Surg Am 1967 Oct;49(7):1359-1370. 8. Melmed S, Polonsky KS, Larseen RP, Kronenberg HM. Williams Textbook of Endocrinolog. 12th ed. Philadelphia: Saunders Elsevier; 2011. 9. Reid IR, Nicholson GC. Weinstein RS, Hosking DJ, Cundy T, Kotowicz MA, et al. Biochemical and radiologic improvement in Paget’s disease of bone treated with alendronate: a randomized, placebo-controlled trial. Am J Med 1996 Oct;101(4):341-348. 10. Siris ES, Roodman GD. Paget’s disease of bone. In: Favus MJ, editor. Primer on the metabolic bone diseases and disorders of mineral metabolism. 6th ed. Washington, DC: American Society for Bone and Mineral Research; 2006. p. 320–330. 11. Rios M, Langston AL, Alonso N, Goodman K, Selby PL, Fraser WD, et al, Mutation of SQSTM1 are associated with severity and clinical outcome in Paget’s disease of bone. J Bone Miner Res 2010 Nov;25(11):2368-2373. 12. Wells C, Woodhouse N. Paget’s disease in an Anglo-Saxon. Med Hist 1975 Oct;19(4):396-400. 13. Altman RD. Musculoskeletal manifestations of Paget’s disease of bone. Arthritis Rheum 1980 Oct;23(10):1121-1127. 14. Woodhouse NJ. The clinical applications of calcitonin. Br J Hosp Med 1974 May;2:677-684. 16. Woodhouse NJ, Crosbie WA, Mohamedally SM. Cardiac output in Paget’s disease: response to long-term salmon calcitonin therapy. Br Med J 1975 Dec;4(5998):686-688. 17. Woodhouse NJ, Joplin GF, MacIntyre I, Doyle FH. Radiological regression in Paget’s disease treated by human calcitonin. Lancet 1972 Nov;2(7785):992-994. 18. Bordier P, Woodhouse NH, Joplin GF, Tunchot S. Quantitative bone histology in Paget’s disease. J Bone Joint Surg Br 1972;54:553-554. 19. Matthews BG, Naot D, Bava U, Callon KE, Pitto RP, McCowan SA, et al. Absence of somatic SQSTM1 mutations in Paget’s disease of bone. J Clin Endocrinol Metab 2009 Feb;94(2):691-694. 20. Doyle FH, Woodhouse NJ, Glen AC, Joplin GF, MacIntyre I. Healing of the bones in juvenile Paget’s disease treated by human calcitonin. Br J Radiol 1974 Jan;47(553):9-15.